Several weeks ago Canon announced their long anticipated entry into the mirrorless camera segment, the Canon EOS M. While Olympus and Panasonic were early pioneers in this market, Sony soon joined them and raised the bar with their NEX line, including the current NEX-5 and NEX-7 (and upcoming NEX-6). Nikon then came along with their Nikon 1 series, the J1 and V1, leaving Canon as the last of the major players to bring out a mirrorless offering. Mirrorless interchangeable lens cameras are a sort-of hybrid of a high-end compact camera and a dSLR system – with various advantages and disadvantages born of this mix. Then are much smaller and lighter than a dSLR, while still allowing one to change lenses. Thus rather than a lower-quality all-purpose built-in zoom of a compact, one can use a variety of lenses to fit their needs (wide angle, telephoto zoom, etc.) and allow them greater control over aperture settings and depth of field. However, many of the cameras require the use of smaller (and lighter) lenses specifically designed for the mirrorless body, and most manufacturers offer a very limited set of lenses at this time. Many brands offer adapters to allow the use of dSLR lenses, but adding a larger and heavier lens may defeat the purpose of a small, light, portable mirrorless body! Mirrorless cameras don’t have an optical viewfinder but instead use a rear LCD screen like a compact camera – plus some models offer a standard or optional electronic viewfinder (a teeny tiny LCD screen in a viewfinder). One of the important advantages is that the mirrorless cameras contain a much larger image sensor than most compact cameras, with some of them (such as the Sony NEX models) even boasting an APS-C size sensor. 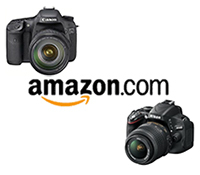 (APS-C is the same size as found in most entry level, intermediate, and pro-sumer dSLR cameras from the Canon T4i or Nikon D3200 to the Canon 7D or Nikon D7000 and D300S. Professional dSLR cameras such as the Canon 5D line and the Nikon D700/D800 have a larger, full frame sized sensor). These larger sensors provide much better image quality and better low light / high ISO performance than most every compact camera. Mirrorless cameras don’t share the same phase detection autofocus system as a dSLR with a dedicated AF sensor, but instead have a contrast-detection AF system that uses the image sensor to focus, just as if using a dSLR in Live View mode. This contrast AF system is typically slower than the dSLR system, which contributes to a bit more shutter lag than the near-instantaneous response of a dSLR shutter. However great improvements have been made in the AF systems and shutter lag of the mirrorless cameras. While the new Canon EOS M is not yet out there for real world use and review, many including myself are very pleasantly surprised with all that it offers, based on its specs. The EOS M take nearly all of the great features and capabilities of the extremely competent Canon T4i dSLR, and packages it in a small, light, and portable body. The major difference of course is of the phase detection AF system of the T4i which is not able to be fit and used inside the EOS M. The EOS M is thus very comparable to using the T4i in Live View.